FAST FUN! 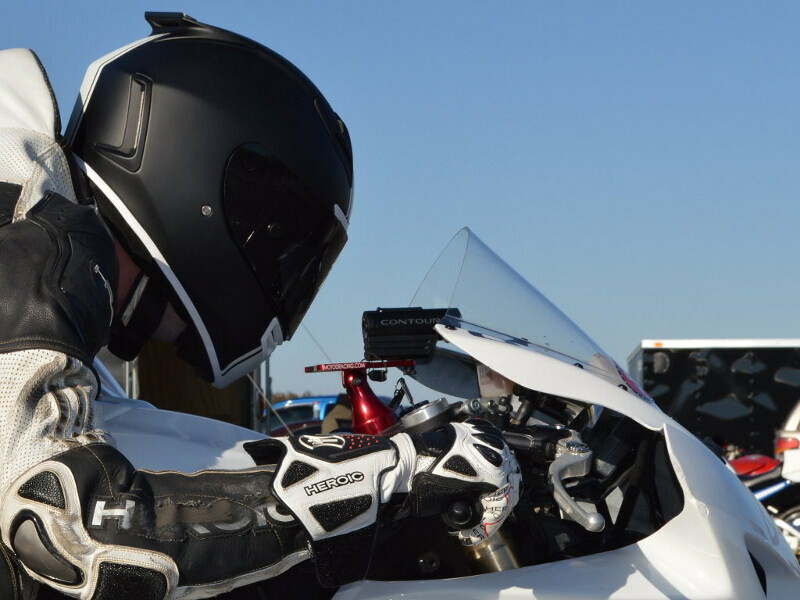 Lightweight GPS iPhone Motorcycle Camera Mount for Sportbikes. Secures iPhone with special tripod case, mount laptimer, GoPro, and Ez-Pass. 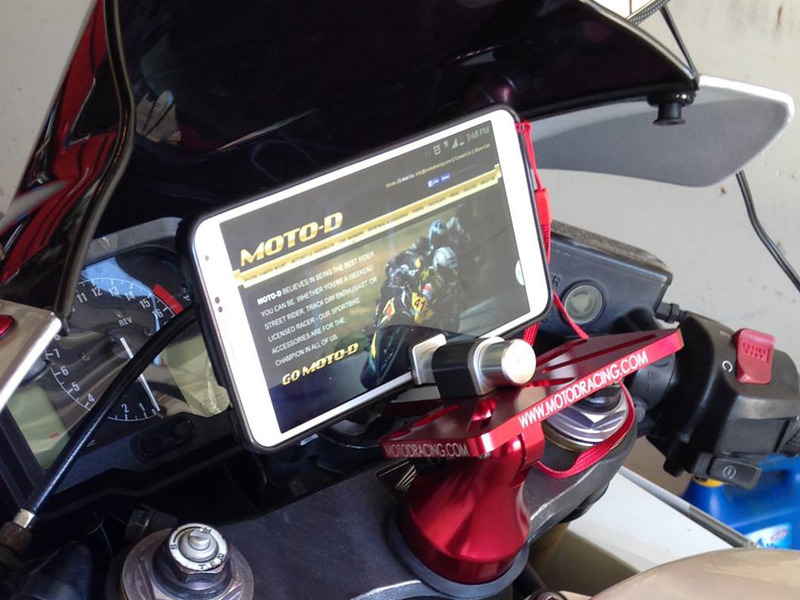 MOTO-D Sportbike Camera Mount (Cell Phone Mount for Android and iPhone) is a CNC machined aluminum billet accessory and camera mount that fits over the sportbikes triple tree center bolt nut. 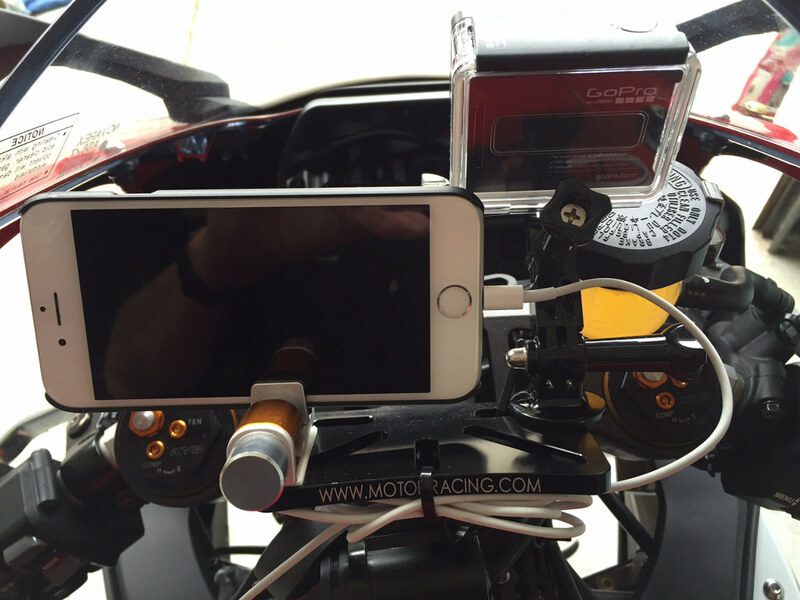 This motorcycle accessory mount is the easiest way to attach an iPhone 4/5/6/+/7, GoPro (Camera), GPS Lap Timer, and Android on a Motorcycle. All basic hardware and easy instructions included. V2 "Triangle" Version. Fits ALL motorcycles with a center bolt no greater than 1-11/16 in diameter and where you can see down the center bolt (may not fit if you have an obstructing steering damper). Sleek and forward design allows racer near full tuck position. Racetrack tested, will not move or rattle loose at high speeds. Tilts for Perfect View without blocking Windscreen, Speedometer or Key Ignition. Anodized in High Gloss Colors; Red, Blue, Gold, or Black. How does it mount to my bike? A threaded rod screws into the base, you then lower through the opening in the center bolt down the triple tree, you secure it with a locking nut where it comes out at the bottom. Total install time 5 minutes. Will it fit my bike? Take a look at your center bolt, if it's unobstructed (or you cn pop off the black plastic cap), then yes. Popular sportbikes include the CBR600RR / 1000RR (non-HESD models), Yamaha R6 / R1, Suzuki GSXR-600/750/1000, and Kawasaki ZX-6R / 10-R (non Ohlins steering damper). We have also mounted easily on Aprilia RSV, Triumph 675R, and BMW S1000RR. How do I install an iPhone 4/5/6/+/7 or Android (Samsung Galaxy / LG)? Use a custom fit phone case (there are many popular brand cases available at your local retailer) that include a 1/4-20 tripod insert built into the case, we supply you with a locking tether and 1/4-20 thumbscrew; after inserting the device into the case, place it over the mount plate and secure with the thumbscrew provided into any of the camera mount holes and tether for safety. What is the GoPro Adapter? A tripod insert adapter for GoPro, after swapping out the standard GoPro base, place it over the mount plate and secure with the thumbscrew provided into any of the camera mount holes. This is the best GoPro Sportbike Mount becuase of it's safe and centralized location just inside the windscreen. Add $20. MOTO-D Motorcycle Camera Mount solution for Honda CBR, Suzuki GSXR, Yamaha R1, Yamaha R6, Kawasaki, Aprilia RSV, Triumph 675, and more. I love it looks good on bike and works good, great fit! The MOTO-D Camera Mount is a solid product that secures very well and looks like it will last with no issues. I have confidence it won't fail in its purpose! This is the best mount on the market period. I am a mechanical engineer by trade and can tell you this is designed excellent. The machining is top notch. This is not some Chinese junk from eBay. 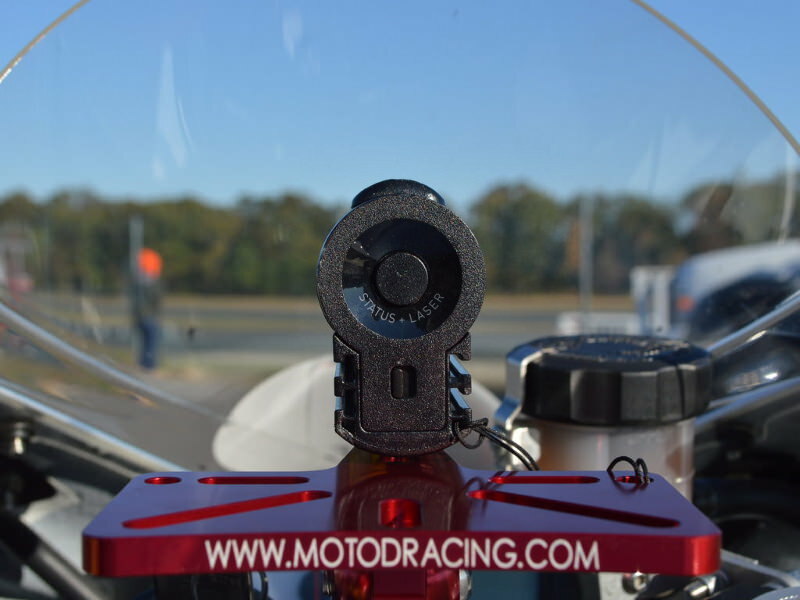 Click the button below to add the MOTO-D Sportbike Camera Mount / Lap Timer Holder to your wish list.